We lie on our backs on the rooftop, hands open like shields toward the sun. Our parted fingers cast striped shadows across our faces, iron-black bars covering our eyes and mouths. Between the bars, a muster of storks spirals away, a slow motion tornado through the crayon-blue sky. Farzana, our tutor, taught us about migration. About swift, sweeping thermals. Vertical columns of wind that lift the birds into an invisible ocean, the current so strong it carries them halfway across the world. We roll onto our stomachs and shuffle toward the edge of the flat concrete roof. Directly below us, some of the women are playing volleyball over a length of tattered rope. Others talk in groups, or hang laundry, or watch their children chase coloured marbles across the yard in a frantic game of tushla baazi. A guard patrols the perimeter in dark green uniform. She smokes a cigarette and speaks into her radio. Behind her, the walls rise high and dirty white, crowned by crazy coils of barbed wire. Maman sits on the steps that lead up to our block. She hunches over and stares at her feet. Her hands rest on top of her head, scarred and swollen from long hours at the loom. She sits alone. She is always alone on Release days. Jahan stands and pulls me to my feet. Balancing on tiptoes, we peer over the wall toward the sprawling clutter of sand-coloured buildings and dust-clouded roads of Kabul. Farzana keeps a map of our country taped to the wall of the schoolroom. She often shows us the city, a narrow valley slashed across the rugged face of the Hindu Kush mountains. There is a single pin in the map. This is where you were born, she says. This is where you live. This is where we have always lived. Jahan touches my fingers, or I touch his. We both recoil. Oqaab is his favourite game. He is the eagle and I am the pigeon. He is much faster and could capture me easily, but stumbles each time he gets too close, allowing me to escape. When the bell sounds, signalling the end of yard time, I stop running. I am dizzy, breathless. A drop of sweat trails down my temple and slides across my cheek. Jahan steps behind me and covers my eyes with his hands. His breath prickles the back of my neck like a hundred pins puncturing my skin. I have something for you, he says. A surprise. A birthday gift. Turning me around, he counts down from ten. I hear a scrape (seven), a rustle (four), a click-click (one), and open my eyes. Laid out on the rooftop before me are two kites held down by chunks of jagged stone. We have always talked about the flying doll game. It must have taken him weeks to build them, to glue the mixture of rice and crushed glass to the string. He has thought of everything, and even has padded gloves for each of us. Slipping our hands into the gloves, we carefully take the sharp strings. We look at each other and smile, waiting in silence for the wind. It must have taken him weeks to build them, to glue the mixture of rice and crushed glass to the string. When it comes, it is a flood. A warm tide bursting through the dam of our anticipation, our hope. We race across the rooftop and launch the kites into the air. They sway back and forth, dancing around each other as we pull the strings one way and then the other. They touch and separate, dip and climb, twist and spin, until finally they collide. 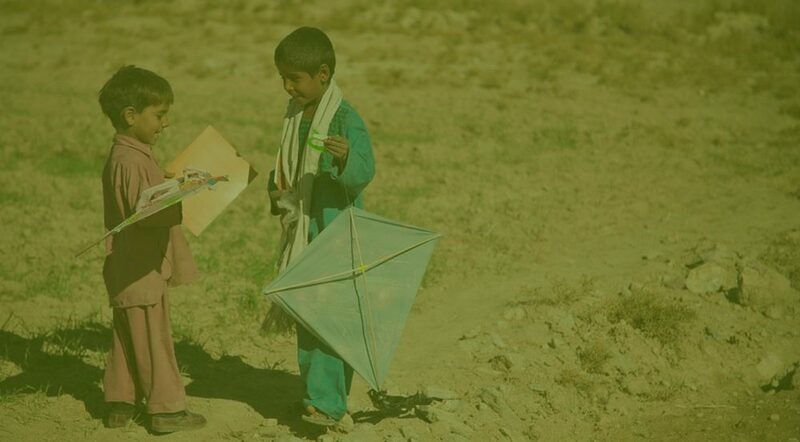 We pull the strings tight, but it is mine that cuts, sending Jahan’s kite tumbling away. Removing the gloves, we link our fingers and press the fallen kite string between our hands. Splinters of glass slice our skin and sink like teeth into our soft fleshy palms. Our blood is hot and blends together. Heavy drops fall onto the rooftop and zig-zag away through a shallow crack in the concrete. The women and children in the yard tilt their faces and turn to follow the untethered kite as it soars above them. Only maman keeps her head down, her eyes closed. After so many years, she can no longer look at the sky. The bell rings again and the gate slides open. Jahan doesn’t move, even though his maman stands with her bag at the threshold, even though the guards blow their whistles and shout his name. It is too bright to look directly at it, but from the corner of my eye I see his kite whirl away until it is nothing more than a fragment in the distance, a single speck indistinguishable from the spiral of storks drifting effortlessly across the sun. Christopher M Drew is a flash fiction writer from the UK. His work has appeared or is forthcoming in MoonPark Review, Third Point Press, Spelk, Ellipsis Zine, formercactus, Bath Flash Fiction, and others. You can connect with Chris on Twitter @cmdrew81, or check out his website cmdrew81.wordpress.com.